The holiday season is upon us. Icicle lights have popped up on neighbors' rooftops seemingly overnight. 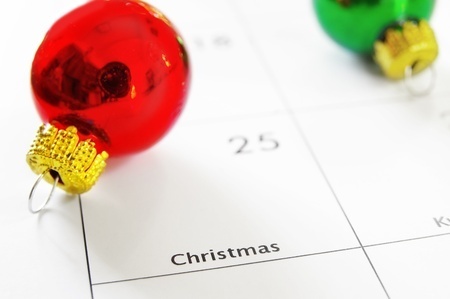 Make the weeks ahead a joy for you and yours instead of a burden with some simple planning. Seasonal jingles and sentiments are suddenly everywhere. Friends and family are calling, wanting to know who's going where this year - and bringing what. It's enough to make the most festive of souls feel Grinch-like. After all, merrymaking of the Christmas sort takes oodles of work - and time. Or does it? With the oncoming seasonal onslaught in mind, I've created this tipsy time table - that is, a week by week guide to getting it all done before Santa arrives, filled with tips and Christmas organizing ideas designed to make the weeks ahead a joy rather than a burden for you and and yours. Deck the halls. Make your home festive. Add a few holiday throw pillows; affix a strand or three of white lights up and down the interior banister; get down that box of decorations and you're on your way. Looking for fresh ideas? Check out these 8 Easy Christmas Decorating Ideas. Rearrange the living room to make room for the tree. Then make plans for the family to pick out the tree and decorate it. Together. Consider a celebratory dinner following the Christmas creation. Finish your Christmas shopping. Plan to finish up most of your holiday shopping this week so you'll have time to enjoy the holidays without having to rush around - or pay last-minute gift prices. Print the holiday card list. Make adds, changes, deletions as needed. And if you don't have those addresses on a computer labeling program, this is the year to set aside time to do it. Take the kids' holiday pictures if you'll be be including a photo with your family card this year. Make your own copies on photo paper at home using your home inkjet computer. Trim with pinking shears, or create an unusual trim of your own. Mail holiday cards. Be sure to create a place to display the holiday cards you receive. Make sure your party clothes are clean. And don't forget to clean or have cleaned the rest of the family's holiday best, too. Wrap creatively. You'll both conserve the environment and create a memorable, personal gift. Consider using things like the kids' artwork for wrap; or make your own from inexpensive butcher-type paper. Buy a few large holiday stamps, some red, green, gold and silver paint and allow the to stamp on their own decorations. Let dry overnight. Create a welcoming guest bedroom. If the gathering's at your home, make sure your guest bedroom is entertaining ready.If the guest room is your office or your child's room, plan now which area you'll clear out to make room for guests' clothes. Create a welcoming guest basket of creature comforts: clove or other scented seasonal soap, toothpaste and tooth brush, bath salts or bubbles, a travel alarm clock, and any other necessities your guests may need. Make your holiday cooking and baking list. Check it twice, then head to the store. Set aside time for family holiday crafts such as making ornaments with the kids. This can be as simple as stringing popcorn to wrap around the tree, or picking up a clear glass ornament at the local craft store and writing the family's sentiments of the season and the year on it in a gold or silver pen. Plan the menu. For Christmas Eve and day, if you're hosting; and any other entertaining you'll be doing at home. Plan breakfast menu for Dec. 25. Even if it's simple, write down the basics and ensure you have them all in stock and ready. Wrap stocking gifts. Do this a day or two in advance so you're not wrapping these must-haves on Christmas Eve. Put these Christmas Organizing ideas into play - and enjoy the holiday season in a joyful, organized fashion this year!